For the first time ever, Wharton has claimed the top spot in Poets&Quants’ composite ranking, narrowly dislodging Harvard Business School which lost the No. 1 honor for only the second time in eight years. The only other time HBS failed to win top honors was in 2014 when Stanford’s Graduate School of Business nudged it aside. Wharton accomplished the feat by moving up a combined 21 places in all five of the most influential rankings used by Poets&Quants to construct its annual list of the best full-time MBA programs in the U.S. Besides tying Harvard in the U.S. News survey for number one, climbing three places from a fourth place finish a year earlier, the school also topped the Forbes ranking this year, moving up six places from seventh. The school also soared eight places on The Economist list to rank fourth from 12th. And Wharton improved its standing on the Financial Times list, edging up one place to rank third this year. The upshot: The most consequential improvement on this year’s P&Q list was scored by Wharton which climbed three places, gaining the most ground of any MBA program in the Top 25. Three schools improved their ranks by two places in the Top 25: the University of Michigan’s Ross School of Business moved up to 11th place, Carnegie Mellon’s Tepper School of Business improved to a rank of 17th, and Georgetown University’s McDonough School also rose two to finish 23rd. Rounding out the top ten schools on this year’s P&Q list was Harvard, just .4 index points behind Wharton, Stanford, Chicago Booth, Northwestern Kellogg, MIT Sloan, Dartmouth Tuck, Columbia Business School, UC-Berkeley’s Haas School, and Yale’s School of Management in tenth place for the third year in a row. P&Q ranks MBA programs outside the U.S. and this year INSEAD won top honors for the third consecutive year followed by IESE Business School in Spain, London Business School in the United Kingdom, IE Business School in Spain, and IMD in Switzerland ( for the full international ranking see The Best International Business Schools of 2017). On P&Q’s lineup of the best U.S. MBA programs, all top ten schools in last year’s ranking, for example, remain in the top ten this year. In fact, every Top 25 school retained its Top 25 status in 2016. While there were some changes, they were slight: Besides Wharton, Ross, Tepper and McDonough, most schools either stayed exactly where they were last year or moved up or down by one place. Only two MBA programs, UNC’s Kenan-Flagler Business School and Rice University’s Jones Graduate School of Management—lost two positions year-over-year in the Top 25. In fact, over the eight years of the Poets&Quants’ ranking only one school has cracked the Top Ten. Yale’s School of Management displaced Duke University’s Fuqua School of Business in 2015 and has remained in tenth place since then (see chart below on ranking changes for the Top Ten schools). 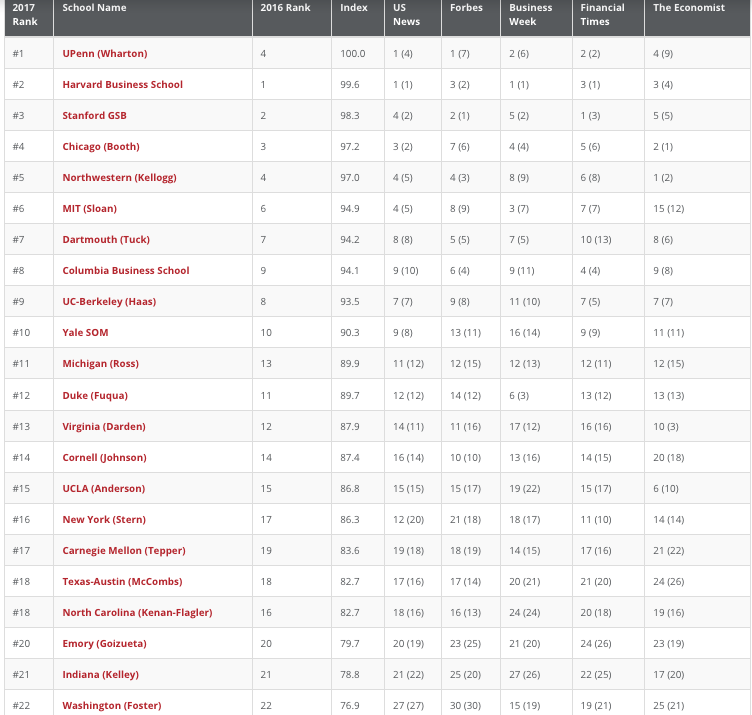 What’s more, users can see at one glance where their target schools fall across the spectrum of core rankings. And for the second time, we’re including year-over-year changes in each of the five lists that comprise our overall ranking (see this year’s ranking tables.) As a result, you can more clearly assess why a school moved up or down on the new 2017 list. 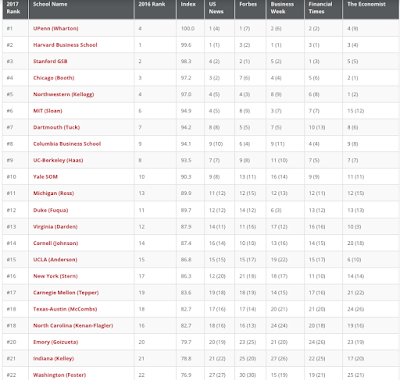 Bigger swings in the P&Q ranking do occur, of course, and they often impact schools further down the list where the data underlying a numerical rank tends to thin out. That often happens when a school lands on or falls off a consequential ranking. The biggest winner this year, for example, was the University of Tennessee’s Haslam College of Business which jumped 24 places to rank 55th this year from 79th. How come? Last year, only U.S. News ranked the school, placing it 63rd. Not only did Haslam improve its U.S. News showing by nine places to rank 54th this year, the school also gained rankings from both Forbes and Bloomberg Businessweek, ranking 54th and 57th, respectively. That boosted the school’s standing by a remarkable 24 places. Similarly, Fordham University’s Gabelli School of Business climbed 21 places this year to rank 62nd from 83rd last year. Why? The school had a 10-place improvement in U.S. News’ rankings this year, moving up to 73rd but just as importantly was ranked for the first time by both Forbes and The Financial Times, ending up in 70th in Forbes and 51st place among U.S. schools on the FT list. While big changes year-over-year are often suspect on a single list, it makes more sense in the P&Q ranking because if all five of the most influential rankings list a school, it leads to a more credible result. Only 42 MBA programs made all five rankings this year. Some 107 schools made at least one ranking list. If a school is only ranked by one or two of the five lists, the resulting rank is less authoritative. Some schools, morevoer, chose to cherry pick rankings in which they have more natural advantages based on a list’s methodology. The P&Q rank, by penalizing schools that are not ranked across all five lists, marks down MBA programs that seek to either game the rankings or simply aren’t good enough to appear on all five lists. In all, nine schools on the Top 100 list registered double-digit gains this year. Besides Haslam and Gabelli, the biggest gainers included the MBA programs at University of Massachusetts, Arizona State University, the University of Utah, and the University of Miami (see chart below). The school that lost the most ground this year? Louisiana State University’s Ourso College of Business. Ourso’s full-time MBA program sank 25 places, the result of a big drop in U.S. News as well as losing its rank from Forbes. The school fell 17 positions in U.S. News to rank 79th this year from 62nd in 2016 and completely lost its 54th place ranking in Forbes. American University’s Kogod School of Business, which plunged 13 places to finish 87th this year on the P&Q list, also did a disappearing act. Kogod fell off of the Bloomberg Businessweek ranking this year after the school placed 43rd in 2016. It also didn’t help that Kogod slipped two places in U.S. News, going to 67th from 65. The University of Missouri’s Trulaske College of Business also experienced o drop in double-digits, falling 12 places to 67th from 55th a year ago (see chart below). But the biggest rankings news this year is the resurgence of the Wharton School. Not only did it manage to pass Chicago Booth and Stanford GSB in 2017. It knocked off the school regard by most as having the best MBA program in the world: Harvard. Achieving the highest rank for its full-time MBA program is quite a feat for Wharton. Unlike Harvard and Stanford, the school has a more complete portfolio of business offerings, including a pair of top-flight Executive MBA programs in Philadelphia and San Francisco and one of the world’s best undergraduate programs. Wharton, moreover, has been a leader in the digital space, the most aggressive player among all business schools in pushing out a wide variety of MOOC courses and leading in the development of MOOC specializations through Coursera. The school also began offering its full-time MBAs the opportunity to spend a semester in the Bay Area on its San Francisco campus. At Garrett’s next town meeting, you can bet that few students will be complaining about Wharton’s rankings.